EconoSpin® All-In-One Silica Membrane Mini Spin Column has been widely used as a low cost substitute for Qiaprep*, Qiaquick*, Qiaamp*, DNeasy*, RNeasy*, PureLink*, GeneElute*, PureYield*, and more. In a stand alone single column format, its application covers from DNA to RNA, from plasmid to viral and genomic DNA, from regular PCR purification to next generation sequencing sample preparation. Since its introduction in 2005, millions of pieces have served scientists around the world. Enthusiasts have honored EconoSpin® in peer-reviewed publications with their own mission-tailored buffers for various applications. EconoSpin® mini spin column is compatible with a wide range of buffers** from all brand names. Notes: *Trade marks owned by Qiagen: Qiaprep, Qiaquick, Qiaamp, DNeasy, RNeasy. Purelink belongs to Lifetech. GeneElute is a trade mark of Sigma and PureYield goes to Promega. Designed with extra considerations for better performance and convenience. Improved o-ring configuration completely eliminates buffer carryover, cleaner DNA for sequencing, digestion and transfection. Large frosted area around the neck instead of the column body, helps to avoid markers smudged by ethanol containing wash buffer. Bed volume of 800ul, binding capacity of 30-40ug allow them to be directly plugged into your existing protocol. Sold with 2 ml collection tubes. 96-well filter plate with long drip for easier sample collection. 850 ul volume capacity and 20-30 ug DNA binding capacity for each well. Compatible with most liquid handlers for automation. Requires centrifuge with swinging bucket rotors. Less expensive alternative to anion exchange columns for large scale plasmid DNA extraction based on silica membrane technology. Overall procedure is faster than anion exchange columns by eliminating ethanol precipitation step. Binding capacity: 200-300 ug for midi and 600-800 ug for maxi, as tested with pBlueScript. Bed volumes: 6.5 ml for midi column and 25ml for maxi. Midi column fits into most 15ml centrifuge/culture tubes, maxi column fits into most 50ml centrifuge/culture tubes. Requires proper centrifuge and rotor. Not recommended for transfection purpose. For high quality DNA used for cell transfection please try our anion exchange column. For international customers we would like to recommend US postal service's priority mail with a flat rate of $65.00 for up to 5 packs of 1910-250 or 1920-250. It will take about 6-10 days for delivery, but is the most cost effective way we can find. Fedex, UPS and DHL will cost at least two times more but will be 3-5 days faster. 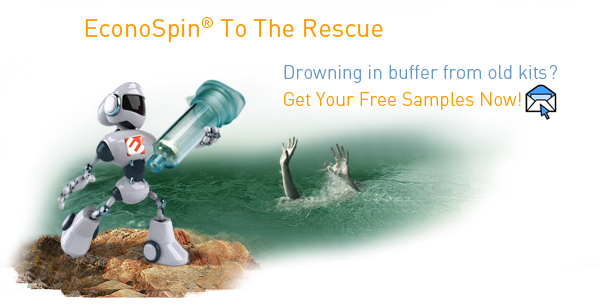 Free samples of EconoSpin® DNA/RNA spin columns are available for testing. Send us an email at columns@epochlifescience.com, tell us what type you need and where to send, our samples will find you by air, land or sea. You can also order a sample pack to start with, free shipping will be provided for all sample pack orders. Share with us your testing results, tell us what you think of them and receive 10% discount for your first order. Your feedback will help us to improve our products, extend our product lines, and to find innovative ways to help you with your research. We are one of your kind, believing innovation comes from dissatisfied people and that science does not have to be expensive. Notes: *The following are trade marks owned by Qiagen: Qiaprep, Qiaquick, Qiaamp, DNeasy, RNeasy. Purelink belongs to Lifetech. GeneElute to Sigma and PureYield to Promega. ** EconoSpin Silica® Membrane Mini Spin Column has been tested to be 100% compatible with buffer set from all silica membrane based commercially available nucleic acid purification kits. References citing EconoSpin® DNA/RNA mini spin columns.